The multiple benefits of natural daylight and views have been well documented, but there is another aspect of fenestration design that needs to be addressed, namely the design challenge of light balance and control, which is critical to a successful outcome. In this regard, it is important to recognize that daylighting has direct impacts on things beyond the provision of natural light and views. If the light is too intense or creates too much of a contrast within a space, then it will be regarded as uncomfortable glare that is not welcome by the occupants. The usual response is to find a way to cover or shade the offending opening, which will likely contradict the design intent and functionality of the fenestration if it is not part of the original design. Similarly, the constant exposure of materials and finishes to sunlight can also cause colors to fade and materials to break down. One of the biggest issues in balancing the amount of natural light with the building is the fact that the solar light passing through fenestration also brings solar heat with it—all year long. That solar heat may be welcome in cool weather, contributing to greater occupant comfort while using less purchased energy for a mechanical heating system. However, during warm weather or in buildings that tend to require more cooling than heating, increased daylighting can bring an unintended penalty of too much solar heating, thus making people less comfortable, causing more air-conditioning to run, and consuming more energy—all the opposite of many original design intentions. The key to good daylighting design in buildings, then, is to find ways to maximize the positive benefits of daylight and solar gain while minimizing the negative possibilities of glare, fading, and energy penalties. Conventional design approaches to find that balance have included some very specific strategies, most of which involve additional building components. For fenestration located on the east and west sides of a building, for example, horizontal or vertical louvers can be applied to the building either on the internal or external side of the wall. External louvers are usually fixed in place and fabricated out of aluminum or other durable materials. Internal louvers may include single or multiple light shelves, adjustable blinds, or similar products. Any of these can reflect light into the space and cause it to disperse; however, they will likely interfere with the view out of the windows. For fenestration that is facing south, horizontal light shelves or horizontal louvers installed either on the internal or external side of the wall work better than vertical ones. An exterior louvered overhang above solar glazing allows more daylight into a space while also blocking unwanted summer sun. For cases where flexibility is sought, adjustable blinds and louvers can be employed provided they are actually used properly on a day-to-day basis, either manually or automatically. They also need to be cleaned and maintained to reflect and operate properly. All of these add-on approaches to light and glare control assume that the fenestration is glazed with clear or tinted glass that is permanent (i.e., static) for the entire life of the building. However, glazing used in fenestration is changing. Traditional static windows can be replaced by new dynamic options that do a much better job of balancing daylight, glare control, and energy efficiency. Specifically, dynamic glazing is an available glass product that tints automatically in response to the sun and can be supplemented with manual control as needed. As a thoroughly 21st century product, the tinting of the glass is controlled by electronic sensors and intelligent controls that allow for variations in the level and pattern of tinting. As such, dynamic glazing enhances occupant comfort and well-being while maintaining a connection to the outdoors. Perhaps equally significant, it changes and controls the light levels without the need for any additional products such as blinds, shades, louvers, or light shelves. Electrochromic dynamic glazing can be automatically or manually tinted to achieve different levels of light and solar heat gain control in response to changing sun conditions. Of course, it should be noted that there are different types of dynamic glazing on the market. Some are based on treating the glass to respond to light (photochromic) or heat (thermochromic), allowing them to change tint based on the level of either heat or light detected in the environment around the glass. Eyeglasses that respond to the difference between indoor and outdoor light levels and tint or clear accordingly are a common example of this technology. There is, however, another type that is more specifically designed for use in buildings. This type is called electrochromic because it uses a very small amount of direct-current electricity to create different levels of tinting. The amount of electricity used is minimal and replaced many times over by the potential energy savings from its proper operation. Electrochromic dynamic glazing is made from panes of conventional float glass that are sputter coated with ceramic layers of metal oxides. The specific processes are proprietary to the manufacturers but are similar to the way low-e glass is produced. In most cases, nanotechnology is used to control layers to a very fine degree. The total thickness of all the layers of an electrochromic coating is commonly less than 1⁄50 of the thickness of a human hair. When a small electronic charge is applied across the coatings, ions travel between layers, where a reversible solid-state change takes place, causing the coating to tint and absorb light. Reversing the polarity of the applied voltage causes the ions to migrate back to their original layer, and the glass returns to its clear state. The coated panes of glass are fabricated into insulating glass units (IGUs) using another piece of glass (clear, tinted, or laminated) and a stainless steel spacer. These IGUs can be fashioned into windows, skylights, and curtain walls, making advanced electrochromic dynamic glazing as easy to specify and install as any conventional static glazing. These glazing products are available in an array of shapes, sizes, colors, and configurations and can be installed in windows, skylights, and curtain walls. The control mechanisms to affect the dynamic tinting changes are typically based on strategies using up to four different tinting levels: clear, light tint, intermediate tint, and dark tint. These different levels help with varying levels of daylight control, glare control, building occupancy schedule, and other building specific factors. An electronic control system can be used to receive automated commands from other devices, such as a daylight sensor, occupancy sensor, or sensors tied into a central building management system (BMS). Commands to tint or clear can also be given manually by using wall switches or similar devices. Either way, depending on the sky conditions (cloudy vs. clear) and sun position, the control system will receive the commands to control tint level to achieve the desired, optimized foot-candle level for the daylit space. With overcast skies, the glass may be cleared to admit enough daylight to achieve optimum illumination. Conversely, with clear skies, the control system can darken or partially tint the glazing to limit daylight to obtain the same foot-candle target, while concurrently reducing solar gain. 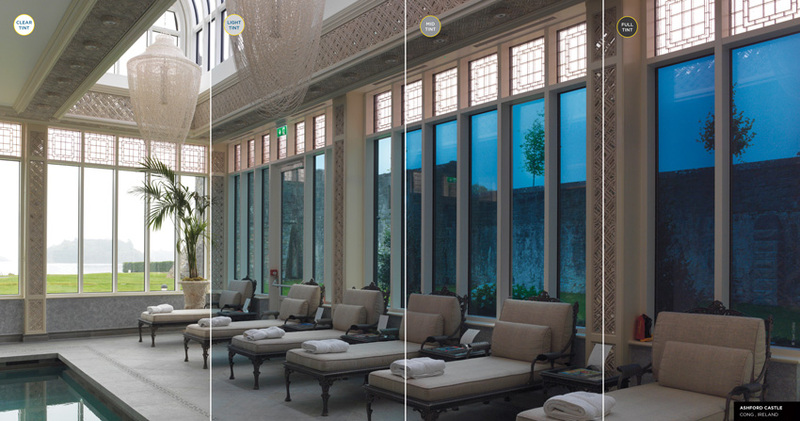 By using multiple sensors in multiple locations, the tint level can be linked directly to the amount of daylight or solar gain desired in any particular building space or even different panes of glazing. Daylighting controls based on seasonal variation can block solar gain in summer to reduce air-conditioning loads or allow more solar gain in winter to reduce heating needs. In this way, dynamic glazing provides much greater energy savings than any static glazing product can deliver. Electrochromic dynamic glazing has advanced to allow for different tint levels to be incorporated into different panes of glass or even within the same pane of glass to achieve desired results. Fenestration provides many real benefits to buildings but can also create some unintended issues. It is therefore very important to assess and understand the design impacts in the amount, type, and characteristics of the fenestration provided in a building. It is equally important to understand the performance capabilities of different fenestration product types in order to achieve the intended overall building performance. Architects who embrace the depth and breadth of available fenestration information and assistance can create truly noteworthy buildings of all types in virtually any location.